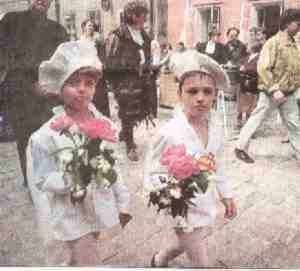 Figure 1.--These boys are serving as pages in a Croatian festival transforming the town into the atmosphere of the Middle Ages. In that era there were no specialized boys' clothes. Boys rather wore small versions of their parent's clothes. Historical clothes for boys will seem remarkable to the modern parent. Even the most fashion conscious mom will marvel at the elegant brocades, lustrous velvets, silks, taffetas, printed, striped and flowered cottons, and laces from which boys' clothes were once made. Clothes included christening, school and party suits, coats, caps and hats, and shoes. The historical paintings and photographs illustrating the various styles should charm anyone susceptible to the enchantment and beauty of childhood and prove, as well, a storehouse of ideas for those concerned with fashion and design. Reflecting the modes and manners of the times in which they were made and worn, the costumes in this display should delight the eye and also touch the heart -- and they will no doubt recall some associations and many memories. The hours of patient needlework and laundering represented by the embroidered, ruffled, tucked and be-ribboned costumes in the exhibition mark their great difference from todays concept of what children will do and what they should wear. But, as Miss Polaire Weissman, Executive Director of The Costume Institute, remarks: "The magic and gaiety of children are both timeless and irrepressible. Looking at these clothes, one imagines they must have been worn very often with child-like delight in and enchantment with dress-up." Figure 2.--Boys until well into the 20th Century wore dresses. At first they were the same styles their sisters wore, but by the late 19th Centuries, dresses especially styled for boys appeared. Note the front buttons and horizontal stripes at the skirt hem. The contrast between today's clothes and even relatively recent boys' fashions is also remarkable. The fact that little and sometimes not so little boys were out fitted in dressses, pinafores, and smocks is starteling to some. The transition from elaborate Little Lord Fauntleroy suits, Buster Brown suits, kilts, and dressy short pants to sneakers ("kicks" in today's vernacular), casual blue jeans, and baggy trousers for boys is an interesting study in social history and the evolution of modern childhood and teenage chique. The mod boy of today would hardly recognize his counterpart at the turn of the century who might have found himself outfitted in a delicate lace collar and fancy velvet knee pants, sailor suits, tunics , or kilts. The hours of work required by the needlework in making elaborate garments, not to mention the task of laundering them gives the modern reader an idea of the importance attached to clothes. Many of the embroidered, lacey, ruffled, tucked and be-ribboned costumes illustrated in this web site required hours of patient work to make and think of the laundering and other care to maintain them for an active boy! These outfits mark the great difference from today's concept of what children should be doing and mehaving and what they should be wearing. Granted boys in all ages have had active minds and able to get up to all kinds of devilment. But one speculates that a turn of the century boy done up in a Little Lord Fauuntleroy suit and lace collar, just couldn't be very naughty. Figure 3.--Fauntleroy suits became less common after the turn of the century, but the style did not disappear entirely until after the 1920s. After the turn of the century Fautleroy sits with shorts ending above the knee and white stockings or knee socks appeared. 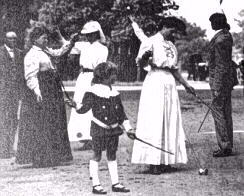 Parents during the Victorian and Edwardian era dressed formally even for travel or leisure activities. Little boys wore dresses, sometimes well passed the todler stage. Once they were "breeched," parents insisted that their children dress formally and smartly to reflect well on themselves and demonstrte their social status. Thus a boy, from an affluent family, even for an outing in the park, would be dressed formally. Such conventions filtered down to middle class families which could afford it. Special formality was expected at parties and other social events. Boys in addition to their rather formal every day or play wear would also have a party suit for special occasions. 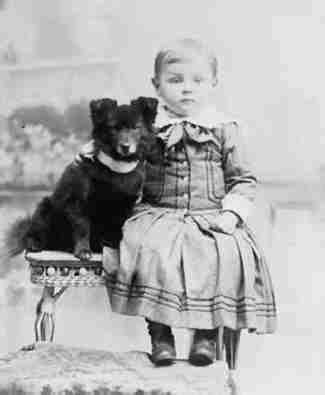 Party suits in the the 1880s-90s were often Little Lord Fauntleroy suits or kilts for boys. They were made for sizes up to 7 or 8, which would mean boys of 9 or 10 would be wearing them. Many other styles were available to the fastidious, fashion conscious mother. Clothes were rather expensive in the 19th Century when measured in real income. The proportion of a family's income that had to be devoted to clothing was rather high, especially for a middle class and working class family. These families did not have huge wardrobes. Mothers tried to get all of the value out of clothes possible. Some mothers might dress all the children in smocks and even pinafores to protect their clothes, although this practice varied considerably from country to country. Onefactor that was a constant throughout Europe was hand me downs-- a fact of life in the large families of the day. Demographics: Imigration restrictions in America reduced the supply of domestic servants willing to work for low wages. This made the job of keeping children outfitted in elaborate formal clothes increasingly difficult. New styles emerged in the 1920s, such as rompers for little boys and short pants with bare knees and knickers for older boys proved much easier to launder than the formal styles worn before World War I. Eventually jeans and sweat shirts proved much more practical and welcomed by boys. Working mothers: Increasing numbers of even middle class women entered the work force during World War I and to a much greater degree during World War II. This meant that mothers could no longer devote all their energies to their families and children, a factor in the growing independence of children. Many diverse factors have helped shape the informal, casual styles that boys wear today. 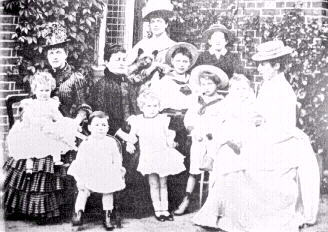 Family roles: Parents at the beginning of the 20th Century, especially mothers, were still choosing their sons' clothing and until they were older teenagers, the boys had little say in the matter. As the Century progressed, family roles shifted. Fathers became less dominate. Mothers were also involved in the work force and away from home. Discipline became much less strict and children exerted increasing influence in family decisions. Boys increasingly exerted more influence on how they were dressed. Mass media: The growth of mass media meant that children's and teenage values and tastes, even those of young children, were heavily influenced by forces outside the family. Children made their desires known in clothing purchases. Parents could no longer dictate fashion. Children are now introduced to a vriety od products and styles, beyond the control of their arents. Affluent American children demanded designer clothing advertised and worn by their friends. Teen culture: Until the 20th Century there was no such thinf as teen culture. Except for affluent families, boys entered the work force at at 12-14 years of age often as aptrentices. The long period of extended education sometimes as young adults is a novel development. Life style: The movement to the suburbs and more informa; suburban life style also affected clothing. Suits were less commonly worn. Increasing demand for comfortable clothes more suitable for active play and sports made the styles emerging in the 1920s more practical. This desire for comfort, practicality, and easy mainteance eventually led to the sneakers, jeans, "t" shirts, and sweats worn today. The children, especially those from well off families, at the beginning of the Century who commonly dressed in fancy, formal clothes--even for play--would marvel and modern children. Today's child would find the clothing common a century ago highly restrictive and uncomfortable. It would certainly inhibit a child who wanted to enjoy the playground in the comtemporary scene. Informal styles are now in vogue with children rarely dressing up and then only under duress. Some wonder about the impact of allowing children to dress and act as adults. In the not to distant past when pre-pubesent boys wore short pants and knickers before they began to shave; getting one's first pair of longies was a major rite of passage. Clothing made it easier for children to think and behave as children. Now even preschool children may be dressed as minature adults, from blue jeans to expensive designer fashions. A whole range of of adult clothing and adult options are now open to children. One has trouble realizing that children are children today and not scaled-down adults as they dress and move like adults. The media protray children as precocious, forcing children to think they should be acting grownup before they are really ready to do so. Many believe we are forcing our children to grow up to early. In the days that short pants and childhood went together there was more time to play, more time to be a child. David Elkind addresses this problem in his thought-provoking book, The Hurried Child. 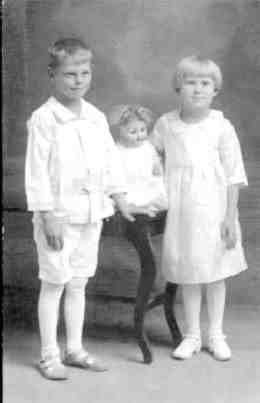 Figure 5.--Short pants appeared in the early 20th Century. At first they were still often worn with long stockings, especially with dressy outfits. Note the sandals, probably red, worn in this photograph taken about 1920. Also note the simple collar. --back to dressing children in adult styles (since the 1960s). Dress like dad: Boys have usually preferred to dress like their fathers and have usually lobbied, when their desires were considered, not to be dressed in destincly juvenile outfits--especially elaborate styles for dress occasions. Teenagers who would develop their own culture beginning in the 1930s, did develop their own styles. While it may have differed from dad's it was very imortant to differentiate from the childish styles from which they had just emerged. Comfort: Boys have generally preferred comfortable, casual clothes to dress clothes. They are almost always less interested in formal, dressy clothes than their sisters. Reject girlish styles: Boys have consistently rejected styles associated with girls. The converse is not true, however, for girls. Girls have consistently added boyish styles to their wardrobe alternatives. When sailor suits became popular for girls, older boys no longer wanted to wear them. When girls began wearing shorts in the 1930s-40s, many boys objcted to wearing them. When knee socks became identified as girls socks in America, boys rejected them. We have archived over 13,000 black and white and images on HBC. Most have never before been published. Images of course require a great deal of bandwith. While we want to make HBC available to as many readers all over the world as possible, we have had to restrict the images. We can not afford the very substantial bandwith harges without your support. Many readers have come to HBC as a result of hits on internet searches on a wide range of topics. Some readers have asked what the focus of the HBC website is. HBC has evolved significantly over time. We began a historical fashion site, but gradually expnded our focus. As we added thousands of pages on historical fashions we began to see that some historical background was needed to fully understand those fashions. We also began to see the fashion pages as a reflection of changing cultural attitudes. Clothing are in fact cultural artifacts of considerable value in understanding any historical period. We see our many fashion pages as small discrete historical documents which can be used in our wider assessment of history. At the same time we began to get queries from the many school children that use our site about not only fashions, but what life was like for children in various historical eras. This brought to mind similar questions raised by students when I was teaching school. In fact, children were obviously present and involved in major historical events. And there role in those events is often neglected. As a result, we have gradually expanded our historical pages. The idea here is to show how children participated in and were affected by historical events. Here there is a strong focus on culture. We have an extensive section on both religion and the fine arts. There is also an expanding section on family life. Thus our site has become a kind of historical assessment of childhood. Fashion has become an important part of our site, but HBC is not just a fashion site, although that was and continues to be a principal topic that our sites is investigating. The HBC web site is divided into several major sections. Over 10,000 pages await you to explore as you pursue this fascinating subject. You may be surprised with the diversity you may have never before knew existed. Most pages are illustrated with, in many instances, never before published photographs, as well as drawings and other art work. We incourage you to peruse all the different main topic sections and related pages. Please let us know if you have any comments or additional information to add. Such comments are a critical factor in building a complete and accurate historical record on boys' clothing. The many varied experiences and styles worn by boys in different countries and decades, makes it difficult for a webmaster fron only one country to fully assess the topic. It is interesting how onkly one or two decades removed from boy hood, fathers find the styles preferred by every new generation of boys mystifying. And of course, as most boys will attest, the fashion sence of mothers can sometimes be disastrous. Thus we are especially interested in any memories you might have about your boyhood clothes and experiences concerning those clothes to help make the often dry stylistic details more meaningful.